If you’ve not yet made the switch to an electric toothbrush, you really don’t know what you are missing! They deliver unparalleled results versus the manual process when it comes to deep cleaning, removing up to 100% more plaque and all round providing a healthy mouth. Now that’s definitely something to smile about! 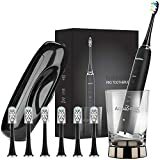 In case you’re not quite sure where to get started in your search for a new smart electronic toothbrush, we’re going to be reviewing three of the best rechargeable toothbrushes for you today that all get a big thumbs up from the dental association as well as the consumers who’ve already made the switch. At the top end of the market, you can expect the most advanced cleaning technology to feature things like built-in timers, multiple cleaning modes, and pressure sensors. One thing is for sure, rechargeable technology has revolutionized the way that we clean our teeth with both sonic and ultrasonic models helping go that extra mile to really keep plaque and tartar at bay. If all of that sounds like music to your ears and you are ready to swap from your current toothbrush to a rechargeable one, read on as together we explore three of the best rechargeable toothbrushes you can invest your cash in. This is one super-stylish and slick-looking rechargeable toothbrush from the Aqua Sonic Black range. At a fraction of the price of the bigger more well-known brands, it still has all the high-end functionality that you would expect to find from the leading competitors. With an ultrasonic motor that is capable of vibrating up to 40,000 times per second, it’s got plenty of power to match those good looks. It seriously works to break down plaque, delivering nothing short of a thorough and deep clean. It also comes with four modes of operation so you can enjoy either a standard clean, a soft and gentle clean for those with more sensitive teeth and gums, a teeth whitening function which removes surface stains and polishes the teeth plus a gum massage mode. Other standout features include a timer that sends an alert everything 30 seconds, indicating that it’s time to move on to the next area of your mouth until you’ve completed the pre-requisite 2 minute clean. The battery has a useful lifespan and with regular twice daily use will last you for an entire month plus there’s also a convenient travel bag provided so that you can take your favorite new purchase with you on vacation. When it comes to brush heads, they supply 6 in total which basically means you can clean your teeth for almost two whole years before you have to lay out any further cash. Protective plastic brush head covers are also included. 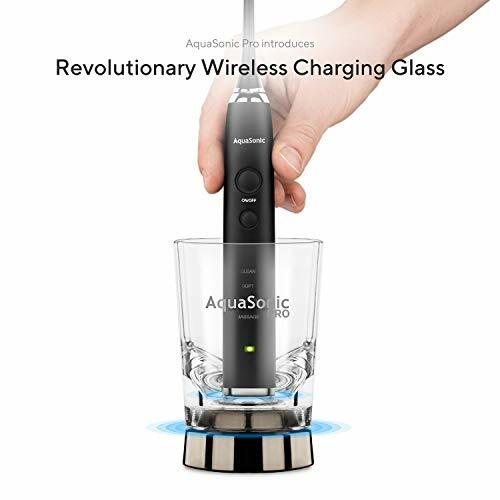 Perhaps the key feature though is that innovative wireless charging glass that can also double up as a rinsing glass. 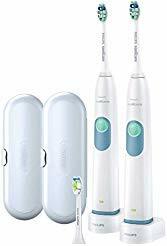 If you are new to electric toothbrushes and want something which is cost-effective and from one of the most recognized brands in the industry, you really can’t go wrong with this Philips Sonicare 2 Series which has everything you could wish for in a rechargeable electric toothbrush. It vibrates 31,000 times per second for a deep sonic clean which is highly effective at removing plaque. It also has a built-in 2-minute timer that delivers the optimal brushing time. Better still, in this particular offer, they’ve doubled up so that you actually receive 2 of everything. That’s right! 2 rechargeable heads are included as well as 2 travel chargers, cases, and sets of heads. Quite literally, this is one rechargeable brush set that the entire family can enjoy. 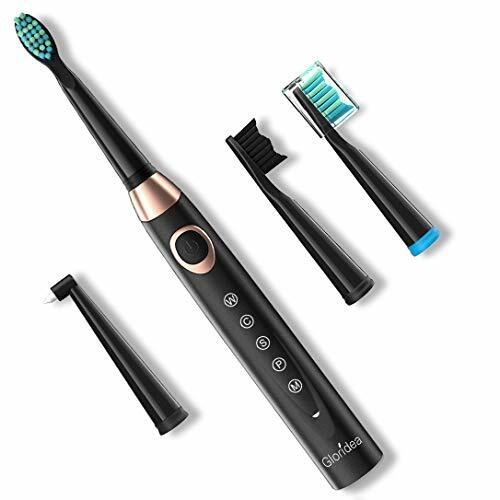 The Sonicare 2 features 2 separate modes, one for deep cleaning your teeth and one for massaging the gums. It’s safe to use on orthodontics and dental work plus it features an angled brush for even better access of those more vulnerable back teeth which can be difficult to reach. We already mentioned the built-in 2-minute timer, but your Sonicare also comes with a quadpacer that sounds a short beep every 30-seconds to remind you to move on to the next area of your mouth. There’s also a two-color battery charge indicator that lets you know that it’s time to recharge. With regular use, you should get 2 weeks usage from your Sonicare 2 rechargeable toothbrush. First of all, we need to talk about the price. It’s seriously budget-friendly so much so that you probably won’t even believe that you could ever purchase such fantastic rechargeable electric technology for the sub $25 price point. It’s not just the price which is attractive though. 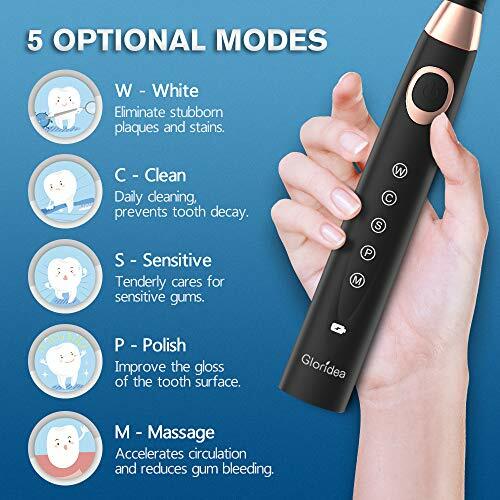 This Gloridea 5 Mode toothbrush looks sleek and elegant plus it oscillates up to 40,000 strokes per minute which means that it is excellent at removing plaque, food residue, and microbes. The specially designed brush heads can even remove plaque from those hard to reach places without damaging tooth enamel or your delicate gums. The unit can be quickly charged via USB with a full charge taking 4 hours. You should easily get a full month’s usage out of your Gloridea before you ever need to recharge it. Just like the more expensive models on the market, this unit has a 30-second reminder as well as a 2-minute overall timer plus it’s slim and lightweight so perfect for travel. There are an impressive 5 different operating modes so you can take your pick from whitening, polishing, cleaning, a sensitive mode as well as gum massage one too. Furthermore, it’s waterproof and comes with 3 toothbrush heads. All in all, it’s a sound investment that for its incredible price will certainly take some beating. 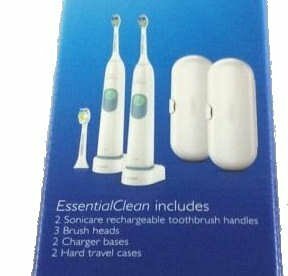 If you’re looking for the best rechargeable toothbrush around, then any three of our recommendations represent excellent choices and will certainly help in your mission to achieve a cleaner and more hygienic mouth, healthier gums, and a whiter, brighter smile. The all do a fantastic job at keeping on top of that all-important oral hygiene and deliver plenty of features and benefits that you and your teeth will appreciate.